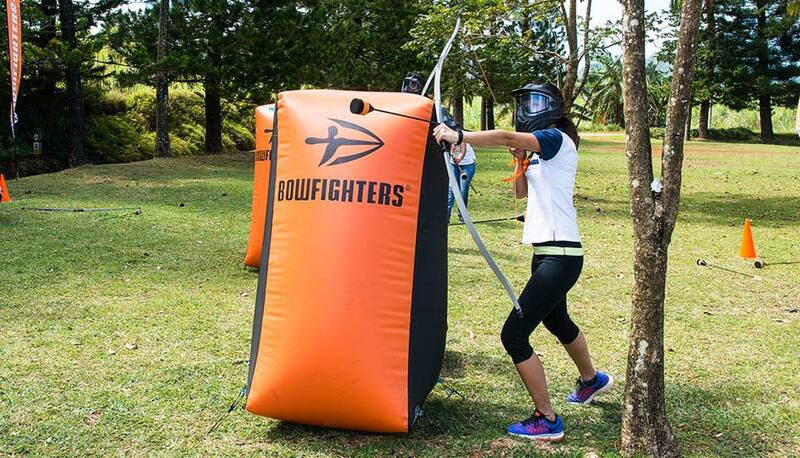 Archery combat game of Bowfighters is a new sport activity which combines the intensity and drive of paintball with the noble art of archery. The game concept was first introduced in the USA. It started quickly gaining popularity in the US and Europe and now is played in 48 countries, including Mauritius. Two teams meet on the arena for a series of archery battles. Each player gets a bow, a mask, and foam-tipped arrows, which absorb almost all the force of impact and softly bounce off any target. 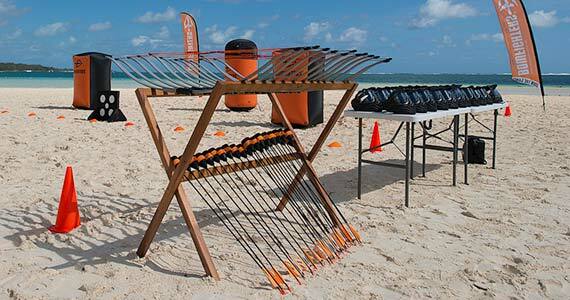 The interactive game provides excellent opportunity to participate in the archery combat in a safe and fun way. There is no need for prior experience or archery skills to play and win! To win the archery paintball game, the participants must hit with arrows all the players of the opposing team, while they can gain additional bonuses by shooting out the spots on the opponent's 5-spots target. Players can implement different strategies during the archery combat, make coordinated shooting attacks, moving across the playground and hiding behind air-inflated bunkers. The Bowfighters Arena is reset for each 8-minute round. If time runs out before one of the teams shoot out all the opponents, the victory goes to the team with more players remaining on the field. The team that wins most of the combat games during 45 minutes, wins the match. The Referee calls are final and incontestable. All Bowfighters players are provided with the special archery equipment. Foam-tipped arrows are specifically designed to absorb almost all the force of impact. Bows and arrows were tested to be safe for archery paintballing without face masks; however, as an added precaution face masks are required. To ensure safety of the archery game, personal bows and arrows are not allowed. Personal masks are acceptable; however, they must be approved by Bowfighters instructors before playing. Our trained staff, the equipment, and the rules governing the archery paintball game guarantee the lowest possible risk of injury to any participant. Age requirements for the archery paintball game participants: 10 years minimum, 12+ recommended; for minors (under 18) waiver is to be signed by a parent. Standard archery game session lasts 60 minutes, including 15 minute briefing, explanation of rules, shooting techniques and target practice, and 45 minutes of gameplay on the Bowfighters Arena. Please arrive at least 15 minutes before your scheduled playing time for orientation: to sign waivers and go through safety instructions. Athletic clothing and footwear are required, also sun protection is recommended for outdoor arenas. 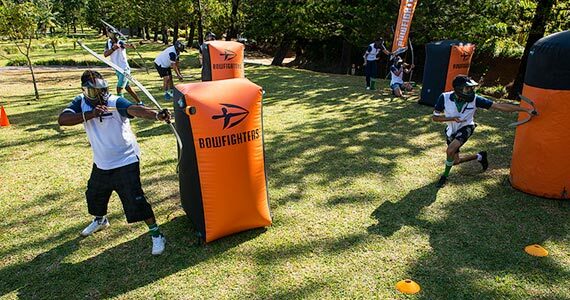 BOWFIGHTERS® - ARCHERY PAINTBALL NOW IN MAURITIUS! 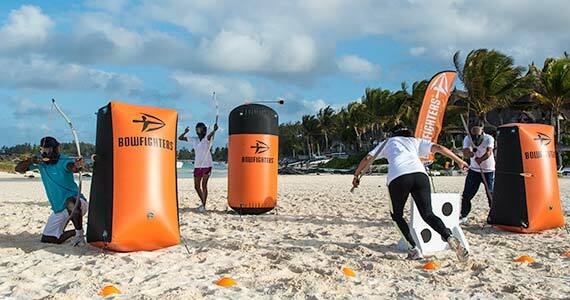 We provide customised opportunities to play Bowfighters Game outdoor and indoor all around the Mauritius island. 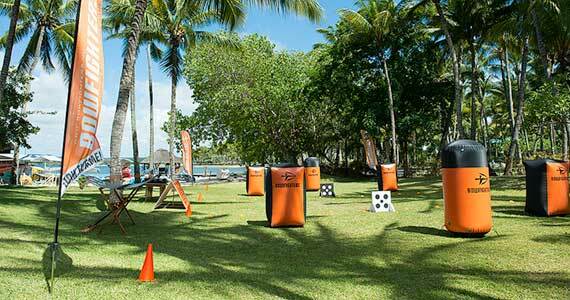 This is the first stationary Bowfighters Archery Paintball Arena in Mauritius. Located in the beautiful surrounding of the biggest natural reserve of the island - Domaine de l’Etoile, the Arena is open 7 days a week from 9:30 to 15:45. Five sessions per day: 9:30 to 10:30, 10:45 to 11:45, 12:00 to 13:00, 13:30 to 14:30 and 14:45 to 15:45. GPS: -20.317164, 57.690868. Our North Arena is conveniently located in the picturesque seaside village of Grand Baie. Easily accessible for Grand Baie residents, it also has a free parking for those coming by car. GPS: -20.000878, 57.583695. The North Arena is open on Saturdays from 10:00 to 15:30. Four sessions per day: 10:00 to 11:00, 11:30 to 12:30, 13:00 to 14:00 and 14:30 to 15:30. We organise archery combat games at your location: at your hotel or university, at your sport club or football ground near you; for birthday parties, private celebrations, team building and corporate events. Minimum booking: 10 bows for a 2 hour session (30 minute briefing on rules, techniques and target practice, 90 minutes of gameplay). Prices include all archery and safety equipment, set-up of a game field at the location of your choice, a trained Bowfighters referee-instructor. 30% booking deposit is required. 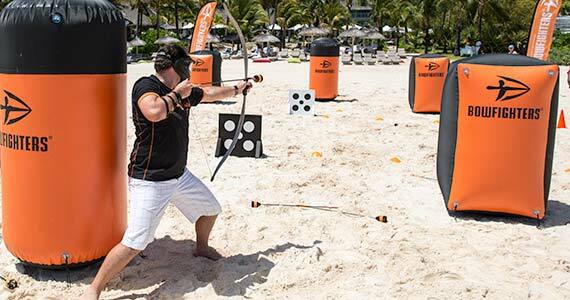 Bowfighters archery combat game has rapidly become an extremely popular corporate team-building activity. The game is focused on teamwork and strategy combined with pure, adrenaline-pumping fun, and it makes for an unforgettable experience! Among other team building activities few could compete with archery paintball, as it provides a unique opportunity to strengthen team bonds in a form of an entertaining activity. In addition, archery game is the teambuilding activity which suits anyone. You don’t need to be physically fit or have archery skills to succeed: it’s all about working together with your colleagues and accomplishing challenging goals as a team. Corporate events have never been so inspiring! 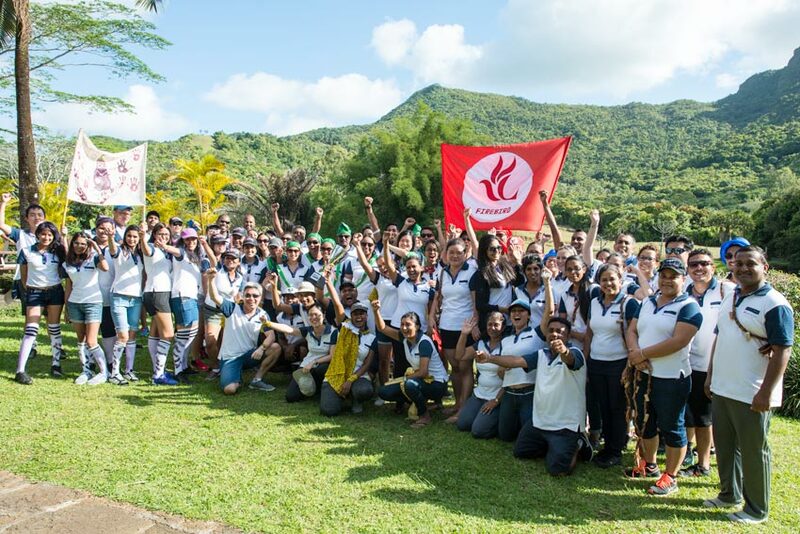 BOOK YOUR NEW TEAMBUILDING EXPERIENCE! We would be happy to make you an offer for a tailored solution. Siege the Castle, KanJam Relay, etc. * - rate for private and corporate events is based on the Standard Arena configuration (10 players on the Arena at the same time). Quotations for other configurations available on demand. What is Bowfighters? Is this paintball? Bowfighters is an Archery Combat Game, it is also called Archery Paintball. 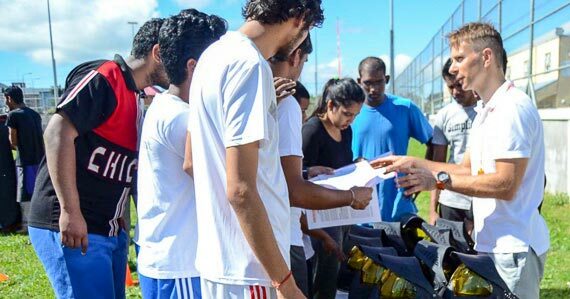 The traditional paintball is formally forbidden in Mauritius. We offer a better alternative: paintball with bows and arrows. The game is played by similar rules, but it is more dynamic, safe and fun. And of course, no paint is used - so you do not need to worry about your clothes! ;) Learn more about The Game: Rules and Admission. What is a minimum number of game participants? At our permanent Arenas, minimum group size is 8 persons, and it may be also possible to join other groups. Our 1-hour event is perfect for 8-12 players. If you have 14 players and more, you may consider organising a private event at the location of your choice. For private events, minimum booking is 10 bows for a 2 hour session, and we do not limit the number of participants. For large corporate groups we organise Bowfighters Tournaments by fully customised scenarios. Book your game here: Bookings. Does it hurt, when someone hits you with an arrow? No! We use specially-designed foam-tipped arrows, which absorb almost all the force of impact and softly bounce off any target. You’ll know you’ve been hit, but it’s not painful and won’t leave bruises or marks. Absolutely! Archery paintball is played with specially designed foam-tipped arrows, so you can have plenty of fun without worrying about getting hurt. Bows and arrows were tested to be safe for operation without face masks; however, as an added precaution face masks are required. Yes. We offer archery combat games for children’s groups of 10yrs+ which can be booked online. When you book via our online booking system, we will send you all the forms and information you need to distribute to other parents. We do also require the adult responsible for the group to be on site at all times for the duration of the event. Does it matter that I’ve never used a bow and arrows before? It’s a great time to start! Our bows and arrows are super easy to use and the expert referee-instructors will take you through a short session on basic archery skills. You will have some time to practice before the game begins. Just sport shoes and comfortable clothing. Other than that, we provide all necessary equipment. ® 2016-2018 Bowfighters and the "Archer" logo are registered trademarks of Vanguard Sports Lab.